Incidents of DUI in Los Angeles can result in drivers exhibiting some very unusual behaviors. But when someone who saw the event tries to describe what happened, other people may find their story hard to believe. 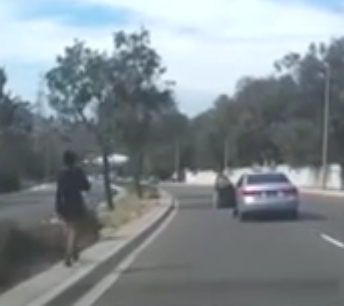 Fortunately for police officers in Rowland Heights, California, they can produce video evidence to confirm that what they said happened to cause a crash actually did occur. But Lacey had neglected to do one important thing—turn the car off. So with the front door still swinging wide open, the car kept moving downhill on the right side of the highway for a short time before crossing the median strip. The Sonata then headed into traffic going in the opposite direction, colliding with an SUV. (Another vehicle, unable to stop in time, then rear-ended the SUV.) Lacey’s car, meanwhile, traveled across the traffic lanes to the side of the road, where an encounter with two small trees finally ended its journey. By some miracle, neither driver involved in the crash with Lacey’s car suffered serious injuries. Police officers arriving at the scene took Lacey to the hospital and eventually charged her with DUI. But officials dismissed charges against her the next day citing lack of evidence.